Protesters help a driver by pushing his car up the street. Photo by Olha Harbovska. Used with permission. The short-lived adoption of laws limiting peaceful protests in Ukraine has sparked violent clashes between police and anti-government protesters on and off since January 19, 2014. The dramatic photos of the tense confrontations, sometimes shrouded in black smoke billowing from nearby burning vehicles, have circulated and stunned worldwide. 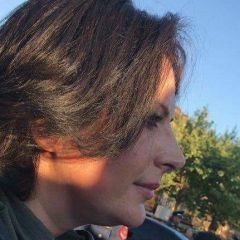 The photos that seldom get play in mainstream media, however, are those of the human side of the long and harsh Euromaidan protests, as they are known, seen in images published on social media and photo stream accounts by protesters and journalists on the ground. 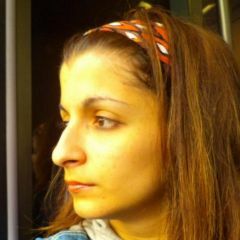 These photos document how protesters have assisted one another to function as normally as possible, while attempting to topple a government they find to be corrupt and failing. 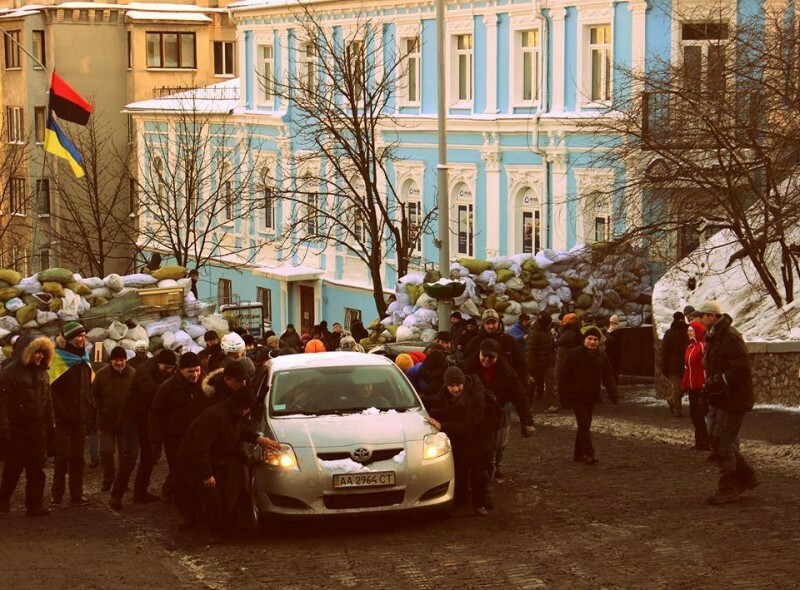 Aside from keeping each other safe and warm, protesters often help those passing by to make it through the crowds and below-zero Ukrainian winter weather. Volunteers also provide free medical help to both sides of the protests. 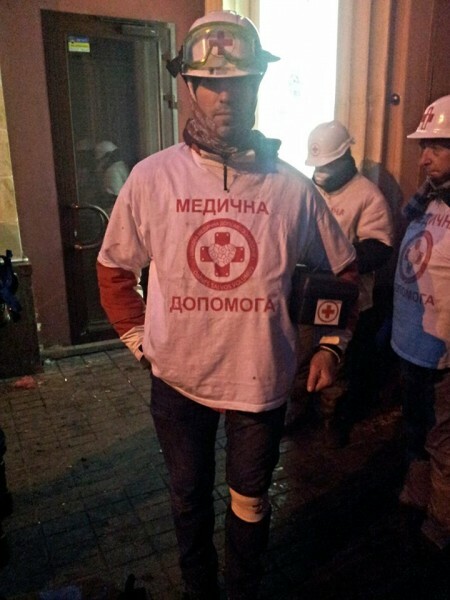 A member of volunteer medical aid brigades in Kyiv. Photo by the creator of Facebook page “Maidaners”. Used with permission. 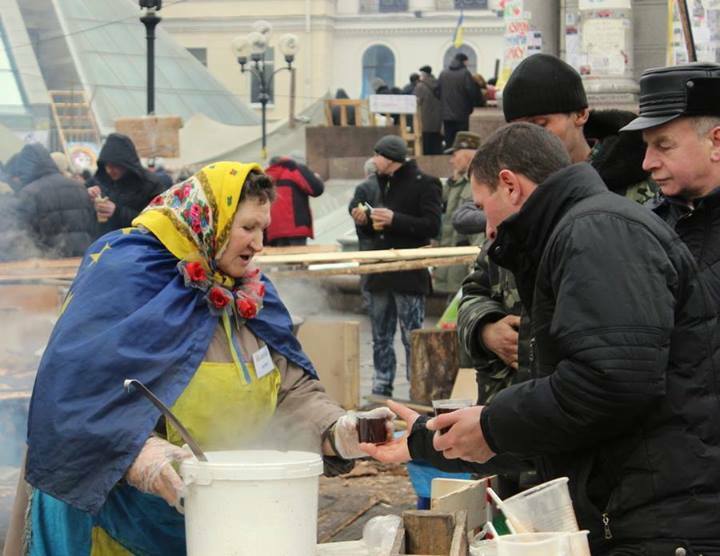 An elderly woman pouring hot tea for protesters. Photo by Olha Harbovska. Used with permission. 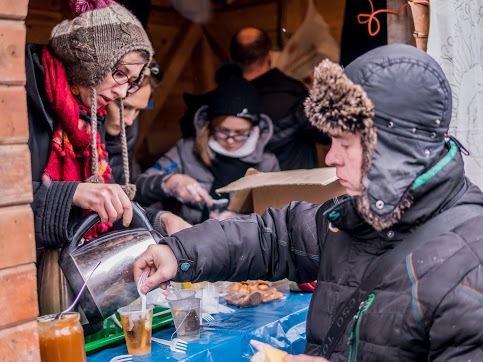 People have set up improvised kitchens and tea stations in Kyiv and other cities to keep fellow keep protesters fed and warm. Volunteers also clean snow and remove garbage from the protest sites. 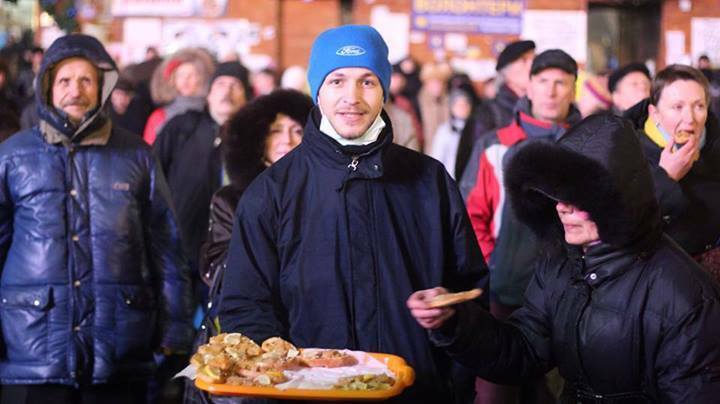 A man giving out sandwiches to protesters. Photo by Hanna Hrabarska. Used with permission. Another tea station to keep protesters warm. Photo by Clashot user Volye101. Used with permission. 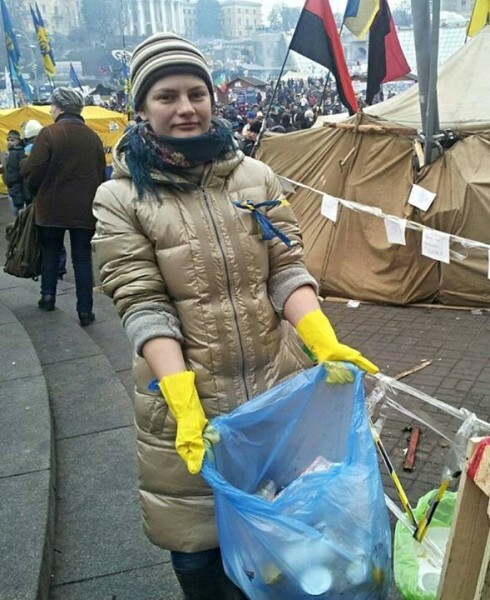 A woman volunteering to clean protest grounds in Kyiv. Photo by the creator of Facebook page “Maidaners”. Used with permission. 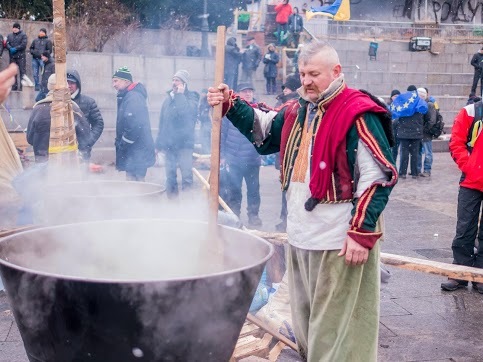 A man minds several cauldrons of food being prepared for protesters, making sure the meal doesn't burn. Photo by Clashot user Volye101. Used with permission. 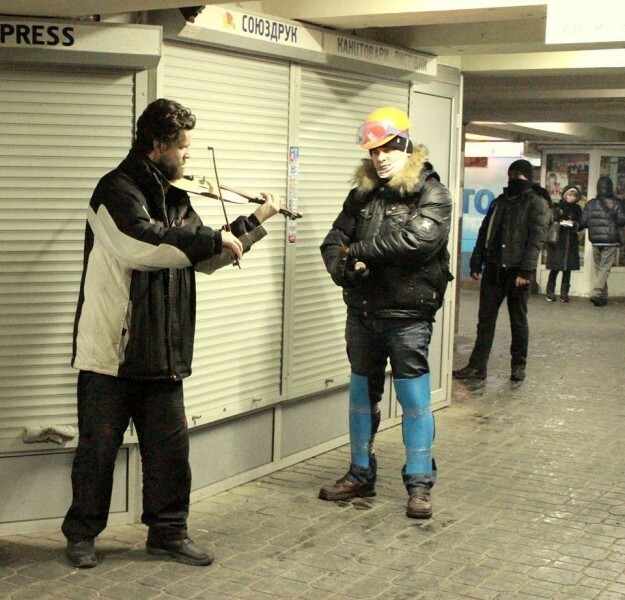 A man playing the violin to a protester in a Kyiv underground passage. Photo by Olha Harbovska. Used with permission. There has also been a lot of visual creativity, with protesters creating posters, painting helmets, tents, etc. 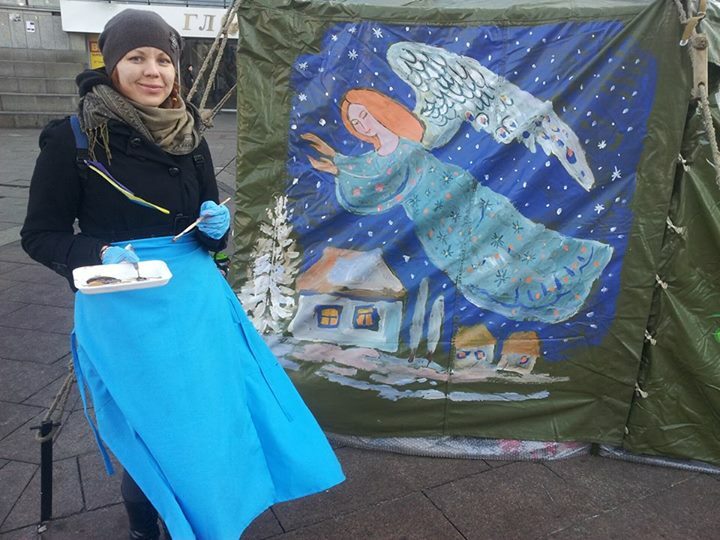 A woman painting a tent at the main protest grounds in Kyiv. Photo by the creator of Facebook page “Maidaners”. Used with permission. 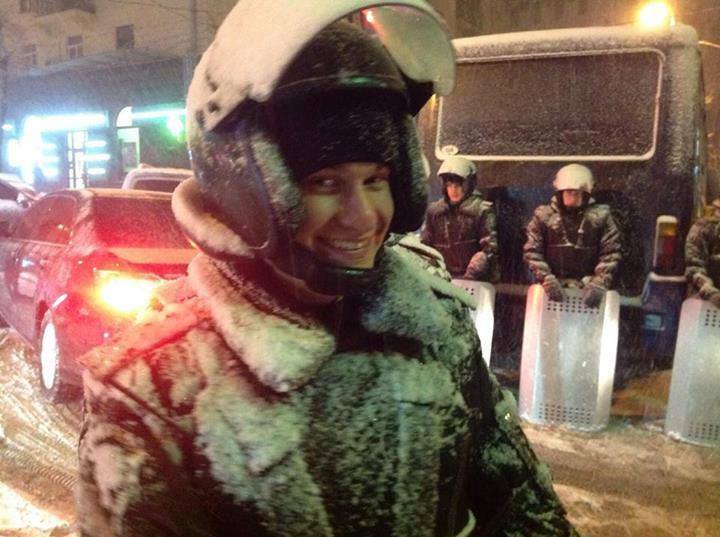 A smiling policeman. He just promised not to use force against protesters. Photo by Hanna Hrabarska. Used with permission. 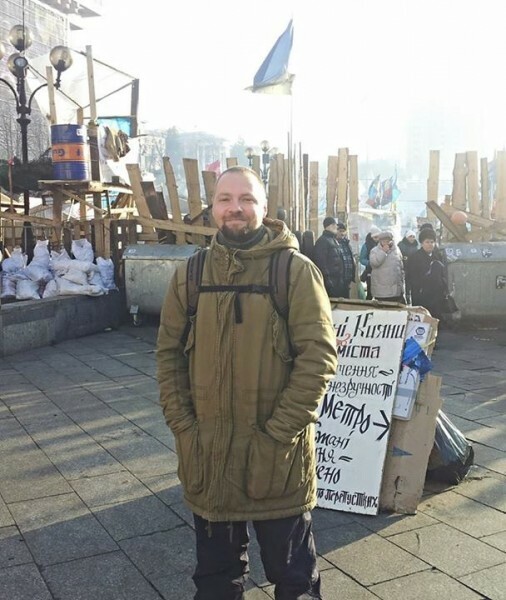 A volunteer defender of protest grounds in Kyiv who initiated the creation of human chain between the protesters and the police to prevent provocations and violence. Photo by the creator of Facebook page “Maidaners”. Used with permission. 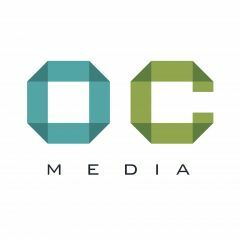 Images for this post were sourced by Global Voices authors Tetyana Bohdanova and Tetyana Lokot. The resurs is called not “Clashdot”, it`s name is “Clashot”. We’ve corrected the captions. Thanks you, Anna! We’ve corrected the captions. Thank you, Anna!